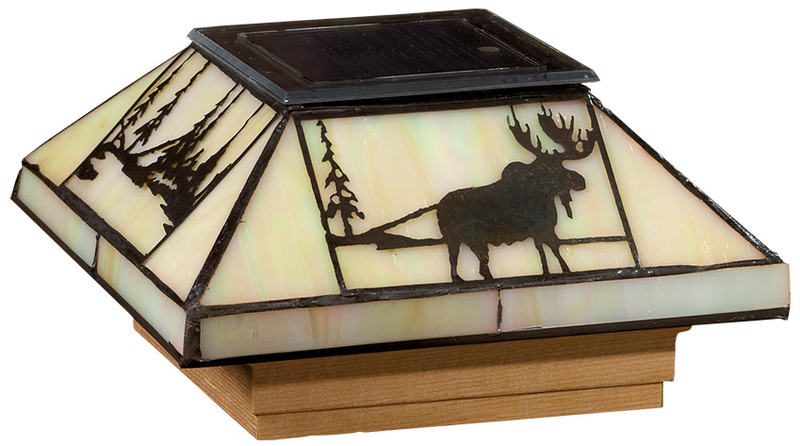 Deckorators® Traditional Solar VersaCaps add style to any posts made of wood, vinyl or composite; and work with most leading post sleeves on the market. 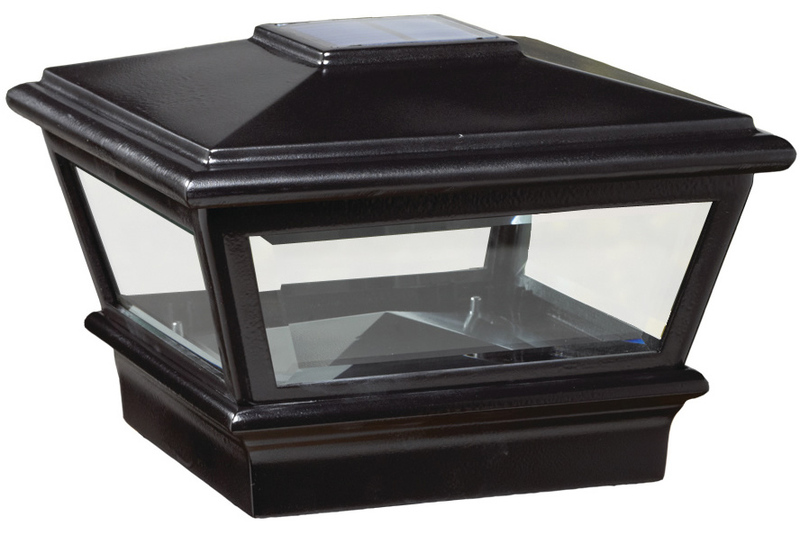 The Traditional Solar VersaCap comes with bracket inserts, so it adapts to fit most railing posts. 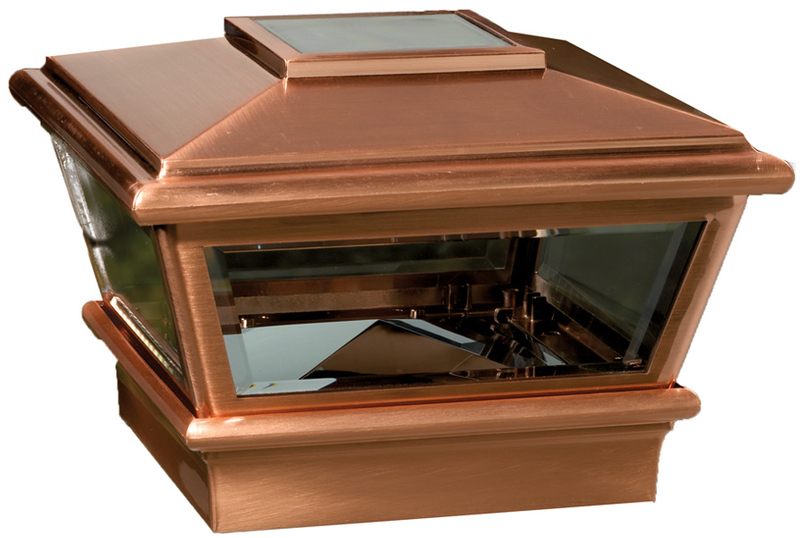 The 4" x 4" option is available in copper, black, white and dark walnut, while the 6" x 6" is also available in bronze. 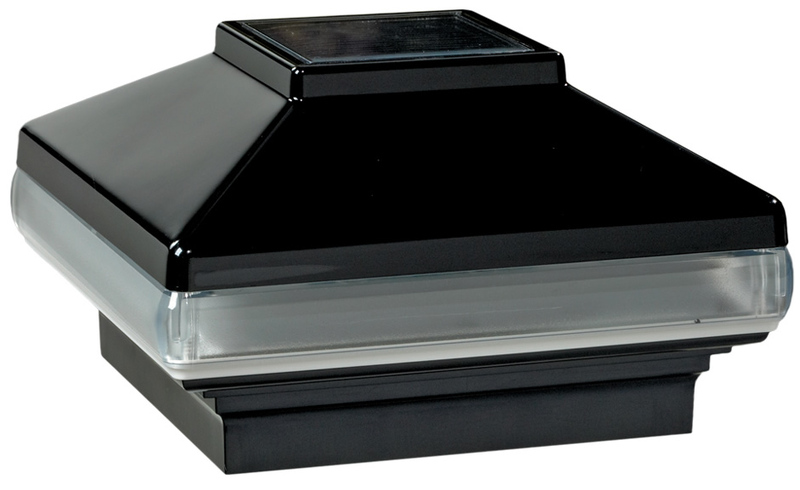 This cap is a great way to add deck lighting without electricity. Two-color post cap plus wireless light. 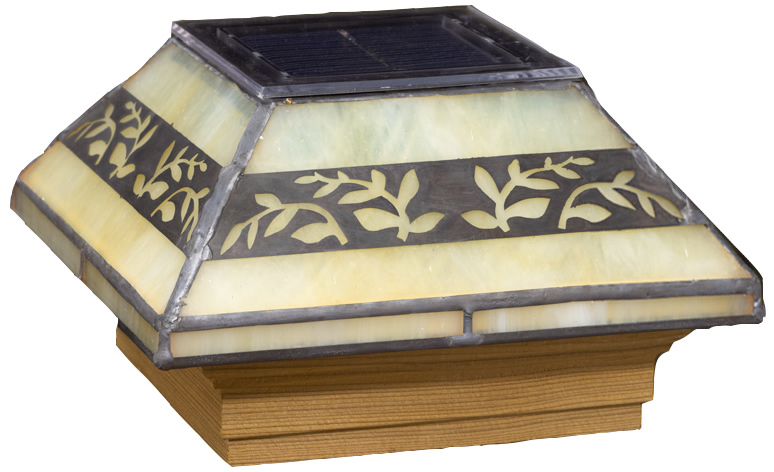 This two-tone solar post cap with an Asian-style design features wireless LED lights, for a welcoming glow at night. Designed to fit over standard 4” x 4” deck posts. Inside dimensions: 3-5/8” x 3-5/8”. 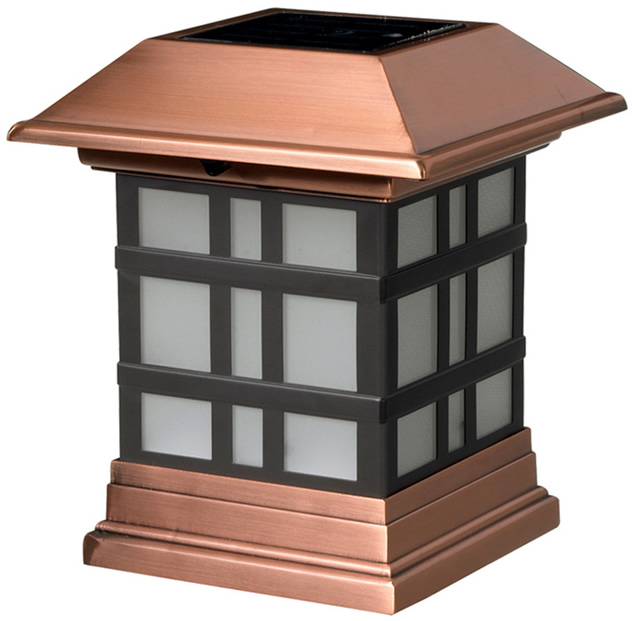 Fits Posts 3 1/2" - 4 5/8"
Traditional style solar post caps feature a durable plastic top and real beveled-edge glass. Available with a cedar or pressure-treated base. Post caps fit over standard 4” x 4” deck posts (measuring an actual 3-1/2” x 3-1/2”). Inside dimensions: 3-5/8” x 3-5/8”. 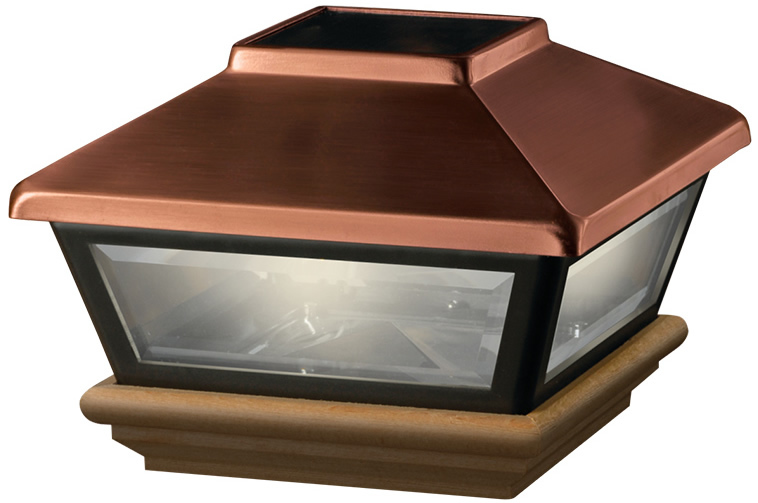 High Point Copper Post Cap features a durable plastic top and plastic lenses. Available with a cedar or pressure-treated base. Post caps fit over standard 4” x 4” deck posts (measuring an actual 3-1/2” x 3-1/2”). Inside dimensions: 3-5/8” x 3-5/8”. Black and white post caps are low-maintenance aluminum with tough powder coated finish; copper post cap is copper-plated plastic. Stylish, slim solar LED light. Fits over 4” x 4” aluminum post sleeve. Inside dimensions 4-1/8" x 4-1/8". 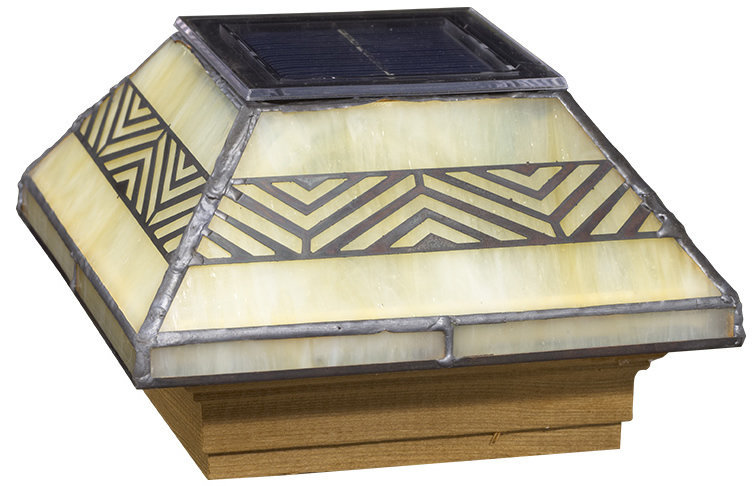 Ambient lighting shines through a cutout geometric design on Deckorators® Labyrinth & Leaf Solar Post Cap. 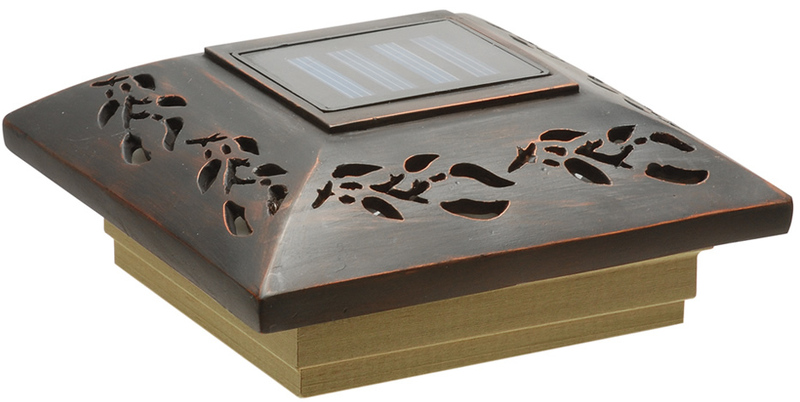 Aluminum solar LED post cap fits over a standard 4” x 4” wood post (inside dimensions: 3-5/8” x 3-5/8”). A stylish way to add wireless lighting to your deck. Available with a cedar base. The charming design, cut into a metal band, decorates a transucent glass post cap. An easy way to add deck lighting without electricity. Handcrafted with exacting standards and excellence. Post cap fits a standard 4” x 4” wood post (inside dimensions: 3-5/8” x 3-5/8”).